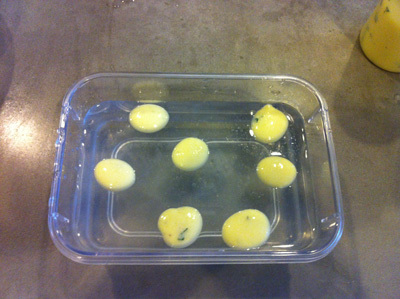 Reverse Spherification involves infusing a liquid with a mixture of calcium lactate glutonate and calcium lactate and then submerging it in a bath of sodium alginate. It is referred to as ‘Reverse’ because the process is the mirror image of the Basic Spherification where the liquid is infused with sodium alginate and submerged in a bath of calcium lactate. Sodium Alginate is an extract found in brown algae and is used to add viscosity to the submerging liquid and to react with the Calcium solution to quickly form a gel membrane. Reverse Spherification produces a thicker membrane than Basic Spherification making it more durable and manageable. While it will not be indestructible, you won’t need to take the same care as with the Basic method. Reverse Spherification is very versatile and can be used with nearly any type of liquid. It is especially well suited for liquids with a high calcium content or alcohols. Unlike Basic Spherification, once the sphere is removed from the Sodium Alginate bath the jellification process stops because the sodium alginate which forms the gelatinous membrane is not inside the liquid itself. 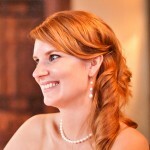 You can hold the spheres for a long period of time so you can prepare these well in advance. Liquids with a high level of acidity are no problem for Reverse Spherification and will need no adjustment as in the Basic method. Reverse Spherification takes much longer than Basic as the sodium alginate bath needs 24 hours of rest time to eliminate air bubbles unless you have a Chamber Vacuum Sealer. Getting a perfect sphere takes a bit of practice with Reverse Spherification. 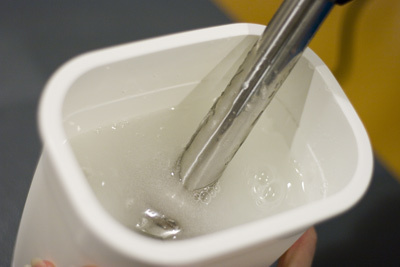 The liquid will quickly take shape once poured into the sodium alginate bath. If it is poured slowly you’ll end up with a flowing amoeba like shape. Additionally the spheres (or whatever shape you end up with) need to be kept separated from each other in the bath or they will stick together. Reverse Spherification works best for larger spheres rather than the smaller caviar shapes as the liquid needs to be dense enough to penetrate the sodium alginate bath. As mentioned above Reverse Spherification works well with liquids that are high in calcium, have any pH, and works well with alcohol. 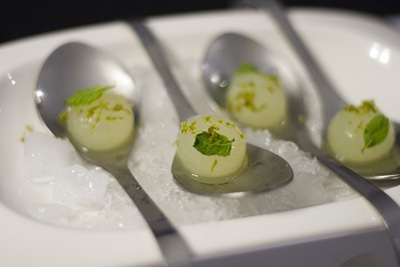 Check Out The Video Coupled with the Mojito Sphere Recipe! 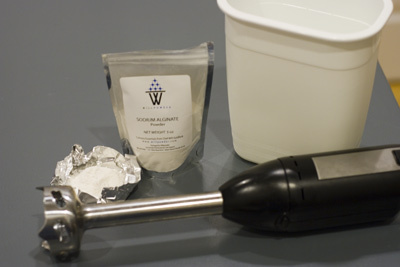 Using an immersion blender mix a solution of sodium alginate and distilled water in the proportion of 0.5%; that is 5g for every 1,000g of water. As sodium alginate is a very gummy extract this will take some time and you may need to scrape sodium alginate off the immersion blender. Please refrain from using your fingers while the blender is plugged in! Once the sodium alginate is fully blended place the mixture in the refrigerator for at least 24 hours to let the air bubbles dissipate. Following the recipe add the calcium glutonate and / or calcium lactate to the main liquid. These extracts are what will react with the sodium alginate to form the membrane. You may also want to add a little xanthan gum to thicken the liquid making it easier to penetrate the thick sodium alginate bath later. At this point you can leave the solution to rest for an hour or more so that any air bubbles from the mixing are released and your liquid is smoother. Typically with Reverse Spherification larger spheres are made from spherical measuring spoons (tsp or tbsp). Choose a dish for the sodium alginate mixture that is large enough for the spheres to submerge without touching each other and large enough for your hands to maneuver closely to the surface of the solution. Scoop the liquid into the spoon and wipe off any excess to avoid it touching the sodium alginate and beginning to form a mass. With the bottom of the spoon barely touching the sodium alginate solution quickly turn your wrist 180 degrees so that the liquid falls into the bath. Ideally it should quickly sink to the bottom. If it does not you may want to spoon a little of the sodium alginate over the top to help create a defined shape. Leave the spheres in for the allotted time, ensuring all parts of the sphere are exposed to the solution by moving those around that stick to the bottom. 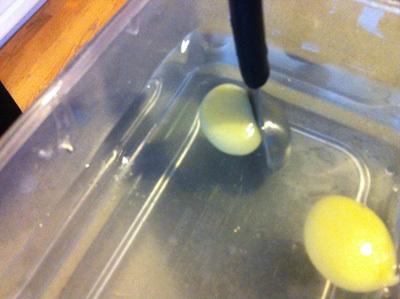 Once done remove the spheres with a metal slotted spoon and let rinse in a clean water bath. You are now ready to enjoy the spheres or store them for up to three days. The spheres can be stored in fresh water or a liquid of similar flavor. I am using your posts in my science fair project. Can you tell me few things?